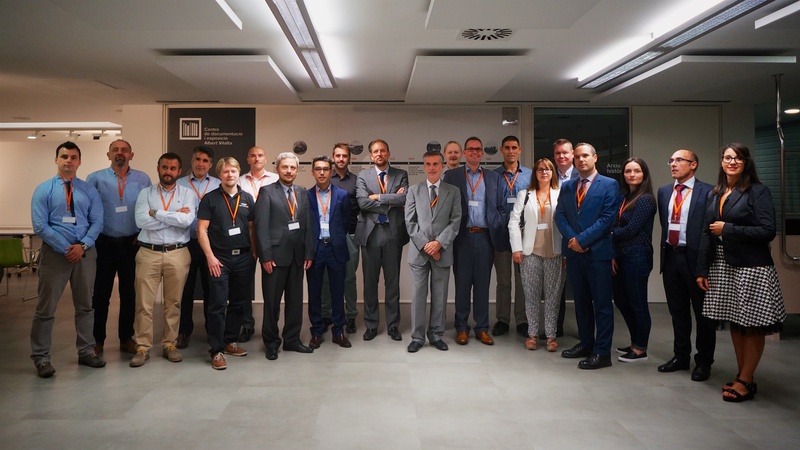 On the 28th and 29th of September the official Kick off Meeting of the Project on the Simulation using Building Information Modeling Methodology of Multimodal, Multipurpose and Multiproduct Freight Railway Terminals Infrastructures (INTERMODEL) took place in Barcelona, Spain. The proposed Action aims to develop a methodology and ICT tools in order to allow an advanced simulation of intermodal railway intermodal logistics platforms models to support tasks related to design and planning phases. The goal of the project is to develop a decision-support platform broadening the decision-making scope and reducing its delivery time based on BIM modelling technology. This ‘investment decision making tool’ will be useful for both public institutions and private organizations in order to assess innovative concepts and designs of maritime and intermodal freight rail terminals integrating simulation modules of the terminal operation and its relationship to the hinterland. IDP hosted this event, which was organized in Ferrocarrils de la Generalitat de Catalunya (FGC) headquarters. Representatives from all of the other partners attended the event – Ferrocarrils de la Generalitat de Catalunya, Consorci Centre d’Innovació del Transport, DHL Freight Germany Holding GMBH, Teknologian Tutkimuskeskus VTT OY, Macomi BV, Vias y Construcciones, Bedeschi SPA, Contship Italia SPA, Autorità Portuale della Spezia, ZNIK, VIASYS VDC OY, BASF Construction Chemicals España SL, and Kiruna Wagon AB. The goal of the Meeting was to discuss the general aspects and the structure of the project and kick-start the ten Activities planned for the Action. The project, funded by the European Commission will run until 2019. For more information about the Kick Off, or about the INTERMODEL project in general, please use our contact form.